I had some time to kill at the weekend there, so decided to kill some time creating new loading screens. I had plans to do something else Rockstar Games related after my GTA Vice City artwork for Edge but I'm generally reluctant to repeat myself when it comes to artwork. 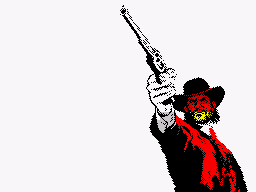 After buying, playing and loving Rockstar's "Red Dead Redemption", I settled on using some of the original artwork from that as a basis for some ZX Spectrum art. 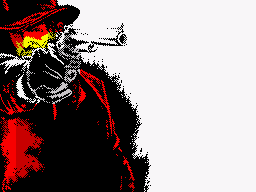 The idea behind this was to create a companion piece for my GTA Vice City art as well as a way to keep the "engine running", so to speak, in doing ZX Spectrum graphics. From Sunday to the Tuesday, I created these. 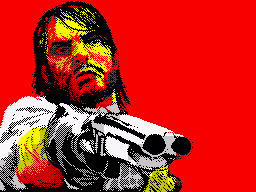 my comment is that i have loads a games on my spectrum that i really like, + some of them are actually more fun 2 play than some games on my ps3,+ i think the reson is cos everybody is obsesed with grafix these days in stead of the fun of games, like trans-formars 4 the zx was graficly mediocre but an amazing fun game, like why dont thay make some kind of game thats like some kind of super hero game were u can play the bad guys, or the, good guys like, there be like 10 heros, + 10 villans, + u can play ither side, or sumit, + each carictor have his own special abillities, rather than having 10 lives you got 10 diferant carictors, each with his own special abilities, if one dies u just pick another. the good guys collect luck points each time thay save a civilian witch thay can spend at end of lvl, but if hero guy starts herting too menny civilians then thay will tern on the hero till end of lvl, bad guys thay dont have too wurry about protecting the civilians, in fact thay can kill um and allso throw them at heros, but thay dont get any luck points, allso theres like some big mad crazzy thing that comes outa the ground every now + then when u least expect it, + it attacks every body cos he dont like no one, + then right at the end of the game u find out that it was not realy properly real + that it was just a manifestation of the incredible hulks screwed up mind, that came out into the world and became real, + then the hero guys get fed up with his weired nes + thay have an argument + then the hulk goes on the rapage + becomes even more strong + bonkers, and then the rest of the heros have to kill him, but then it shows just when u think its all over it shows the hulks one big blood-shot eye opening up at the bottom of the sea...the end.